"All Jews living in the city of Kiew and its vicinity must come to the corner of Melnikova and Dokhturovska* Street. 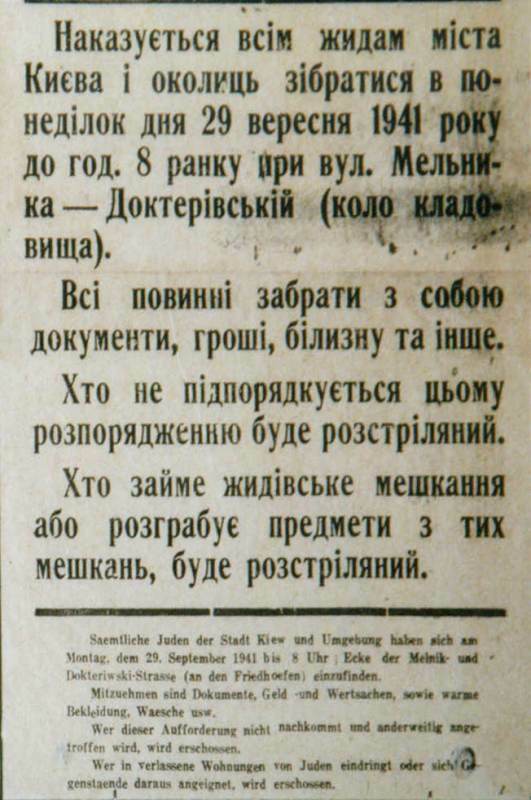 (* misspelled version of Dokhturova Street / today Degtiarivska Street) (near the cemeteries) by 8 o'clock on the morning of Monday, September 29th 1941. They are to bring with them documents, money, valuables, as well as warm clothes, underwear etc. Any Jews not carrying out this instruction and who are found elsewhere will be shot. Any civilian entering apartments left by the Jews and stealing property will be shot."